"DEFORMERâ„¢ by Menny Lindenfeld is the most amazing metal bending tool I have ever seen." 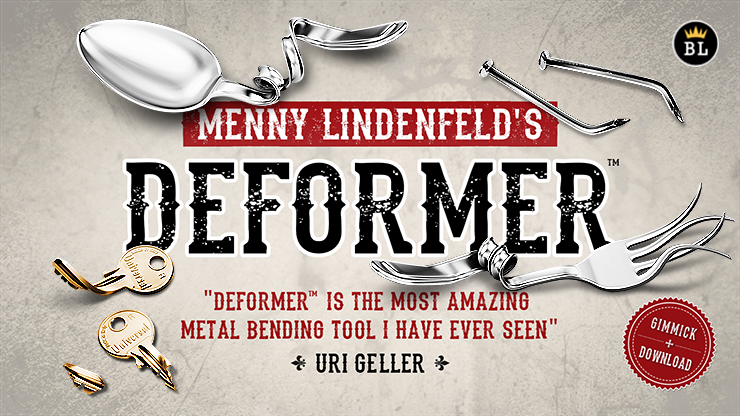 Menny Lindenfeld, the creator of the OX BENDERâ„¢, brings you DEFORMERâ„¢ - The ultimate LIVE SHOW BENDING & TWISTING tool. DEFORMERâ„¢ is a new metal bending tool specifically designed for bending spoons, forks, keys and even nails, into impossible shapes - BENDS YOU CANNOT ACHIEVE BY HAND. DEFORMERâ„¢ is designed for use during LIVE SHOW performances. And to make the bending of strong metal objects SUPER EASY. DEFORMERâ„¢ hides in plain sight. There is nothing to conceal, add, ditch or switch. So you can focus 100% of your attention on presentation. DEFORMERâ„¢ can be used anywhere. Use it impromptu, close up, walk-around, on the street, and on stage. Carry it with you everywhere you go. And It'll always be ready for you, to perform on-the-fly! DEFORMERâ„¢ has been used by Menny Lindenfeld for many years and has been AUDIENCE-TESTED IN COUNTLESS LIVE- SHOW PERFORMANCES. DEFORMERâ„¢ is a high quality, precision-made, metal gimmick, built to last a lifetime! DEFORMERâ„¢ is your secret weapon, that will take your metal bending abilities to the next level. You can also BEND THE TINES to an IMPOSSIBLE 90 DEGREE ANGLE - at the CENTER OF EACH TINE - bend 90Â° to all directions; upwards, downwards or sideways. Or use DEFORMERâ„¢ to easily break an unprepared fork's tine in half. Easily carry DEFORMERâ„¢ with you everywhere you go! Various methods & techniques for using DEFORMERâ„¢ for bending spoons, forks, nails & keys. To bend the tines of a borrowed signed fork into a 90Â° angle (all directions). To bend strong steel nails to a 20Â°-120Â° angle.